"This is about humanity — we're talking about humanity," the president said Monday of the recent suspected chemical weapons attack in Syria. WASHINGTON — Flanked by members of his Cabinet, President Donald Trump on Monday condemned the suspected chemical attack in Syria, calling it a "heinous" act and saying his administration would soon make "major decisions" on how to respond. Trump told reporters all options are on the table. 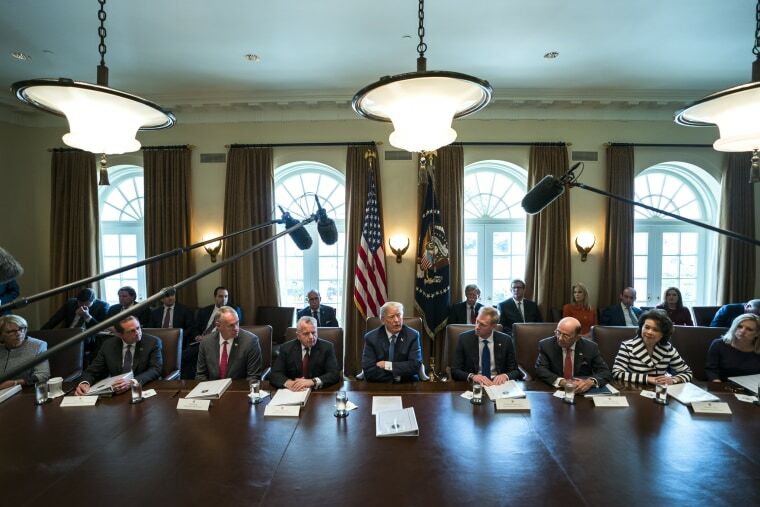 "It was an atrocious attack, it was horrible," Trump said at the White House, with hawkish national security adviser John Bolton, there on his first day on the job, seated behind him. "We are studying that situation extremely closely, we are meeting our military and everybody else, and we'll be making some major decisions in the next 24 to 48 hours." Syrian opposition activists and aid groups said over the weekend that dozens of people had died in the suspected chemical weapons attack on the city of Douma, and aid groups are blocked off from accessing the afflicted area. "If it's Russia, if it's Syria, if it's Iran, if it's all of them together, we’ll figure it out," the president added. "This is about humanity — we're talking about humanity," he said Monday. "It can't be allowed to happen." Syria passed the seven-year mark last month in its civil war that has killed some 450,000 people and displaced half the country's population. The Trump administration has slashed refugee admissions to a historic low and changes to the U.S. Refugee Resettlement Program have left many people in limbo. The White House on Monday called out countries supporting the regime of Syrian President Bashar Assad, including Russia, which Press Secretary Sarah Huckabee Sanders said has "betrayed" its vow to help bring an end to the Syrian government's suspected use of chemical weapons. The alleged attack occurred late on Saturday amid a resumed offensive by Syrian government forces after the collapse of a truce with the Army of Islam rebel group. Douma is the last rebel stronghold in eastern Ghouta, a region that has faced an intensive bombing campaign by Assad's forces. Assad's government denied that it launched a chemical attack. Moscow has called the reports "fabricated" and warned that any military strikes in retaliation would trigger the "gravest consequences." "If he does, it’s going to be very tough,” he added. Sen. John McCain, R-Ariz., tweeted Sunday that Trump's "pledge to withdraw from #Syria has only emboldened Assad, backed by Russia & Iran, to commit more war crimes in #Douma." Sanders dismissed McCain's accusation, saying, "This administration and this president have been tougher on Russia than previous administrations." Trump has called Russia out in the past for its support of the Assad regime, and much of his administration's Iran policy centers around the Islamic Republic’s destabilizing activities in Syria. However, Trump remains open to the idea of speaking directly with Putin, insisting that it's better to find common ground with Russia on Syria, as well as other economic and security matters. "The president still feels that if we can have a good relationship with Russia at some point that that's a good thing for the world," Sanders said Monday. "But at the same time, this president is going to be tough on Russia until we see some changes in their behavior." Trump talked on Sunday with his French counterpart, Emmanuel Macron, and the two leaders agreed to "coordinate a strong, joint response" to the alleged attack. British Prime Minister Theresa May also condemned the suspected use of chemical weapons, and criticized Russia for its continued support of the Assad regime. "In recent years, Russia's repeated vetoes at the U.N. have enabled these rules to be broken, and removed mechanisms that allow us to investigate and hold to account chemical weapons attacks in Syria," May said at a conference in Denmark on Monday. "This must stop." While the U.S. is still investigating the attack, the State Department said on Saturday that "the (Assad) regime's history of using chemical weapons against its own people in not in dispute."